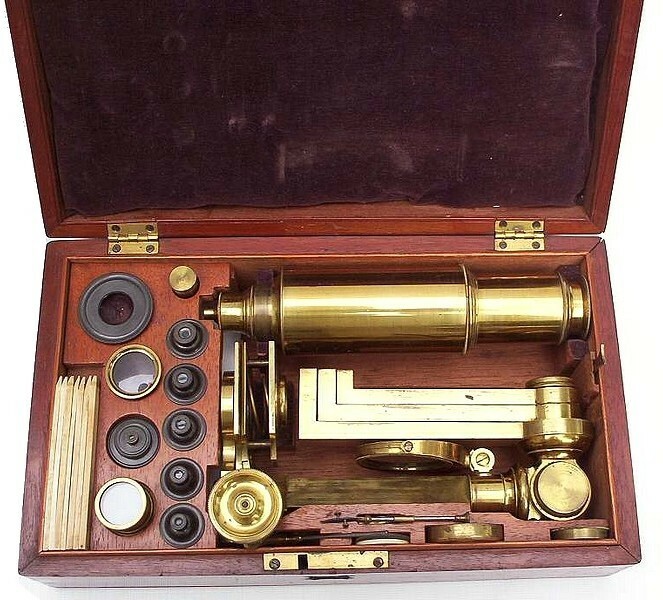 The accessories supplied with this set include six objectives for use with the compound tube, a separate high power objective for when the instrument is used as a simple microscope, an eye-shade for when the instrument is used as a simple microscope into which any of the objectives could screw, a glass bottom stage insert, a live box, a large round glass-bottomed trough, stage and hand forceps, a substage light cone, a stage mounting bullseye condenser, a glass and an ivory stage insert, a brass talc box, and a full set of ivory sliders. 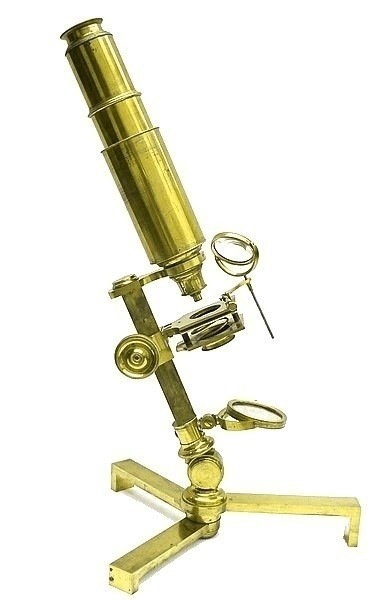 As expected for a microscope of this vintage, the internal optics consist of a double eye lens and a large field lens within the body of the tube. The tube length can be extended by draw-tube. 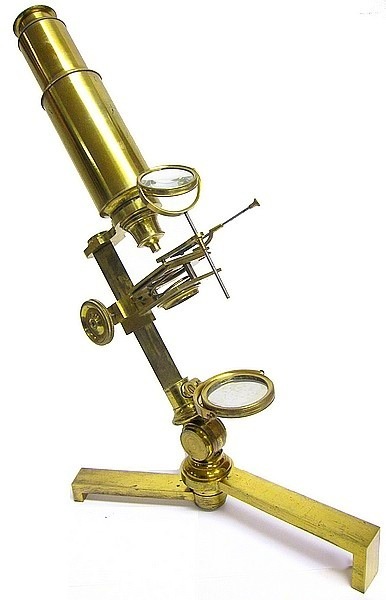 An identical microscope signed "Chadburn, 71 Lord St. Liverpool" is known as is another signed "J.P. Cutts Optician to Her Majesty Sheffield". 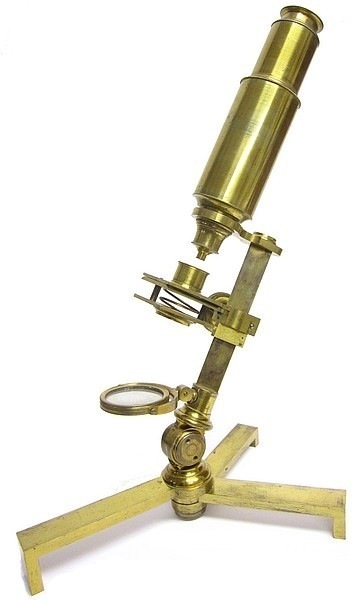 It is not clear which if any of these firms actually manufactured this type of microscope. 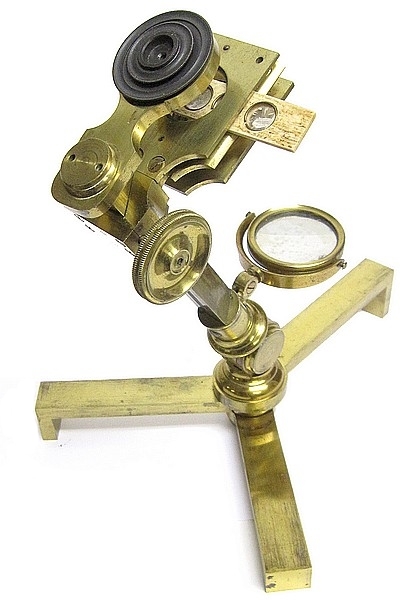 It is possible that these instruments where made for the trade and sold by many different opticians of the period. 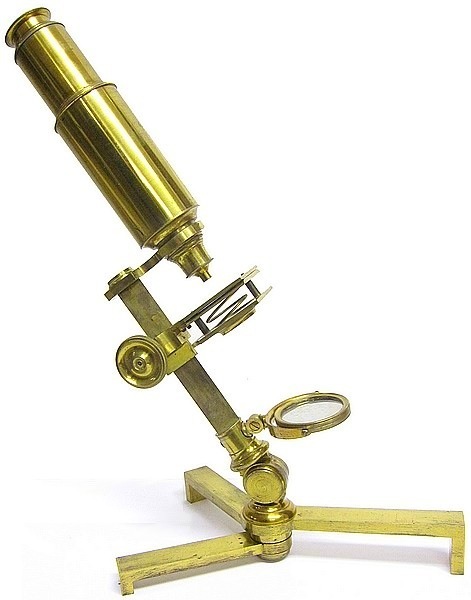 The microscope is of English origin. 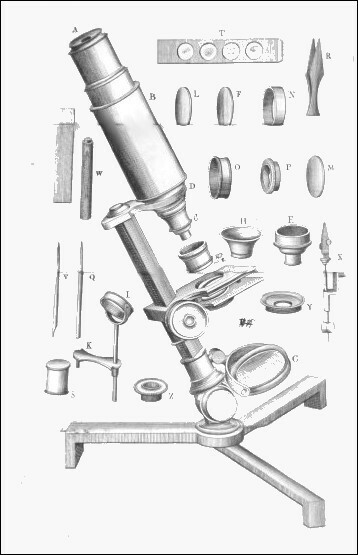 The microscope was purchased for this collection in Canada. 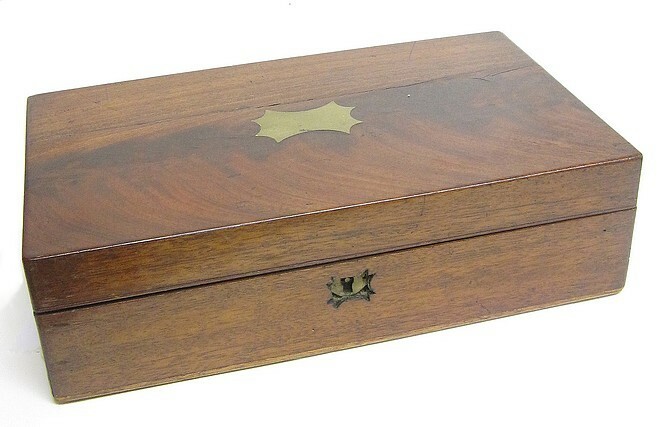 A note within the case suggests that this instrument was imported and sold to John Steele of Ontario. John Steele (ca. 1796-1876) was a merchant, publisher, and local official in the area around Colborne, Northumberland County, Ontario. He came to Canada from Greenock, Scotland, in 1820. He first moved to Montreal, but later settled in the Village of Colbourne, Cramahe Township, Northumberland County. He established himself as a merchant in partnership with Joseph A. Keeler. He later went into the printing business and from 1850 to 1855 he edited and published the Port Hope Watchman, and the Port Hope Pilot. Steele served as Postmaster in 1824, and as a magistrate and chairman of the Newcastle Quarter Sessions. In 1837 he was appointed a member of the Board of Education for the District of Newcastle, and by 1844 was Superintendent of Schools for the District. He was active in the Church of Scotland and its protests against what it considered an Anglican monopoly in the area of clergy reserves. Steele was also a founder and member of the first Board of Trustees of Queen's University. He also took part in other local organizations, including: agricultural societies; the Canada Literacy, Manual Labour and Educational Society,- and the Northumberland Militia, where he held a captaincy in the 3rd regiment.